BERLIN - Perhaps the Berlin baseball team should play rivalry games more often. 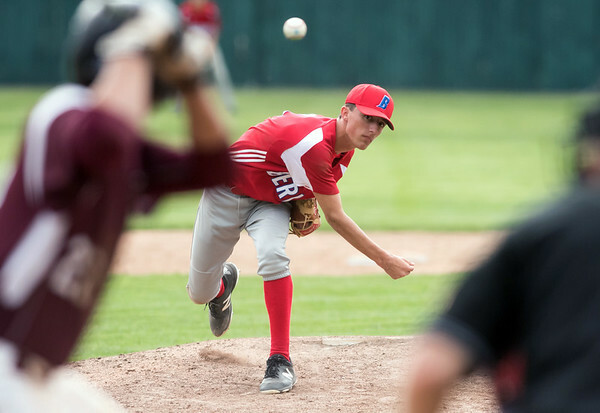 A day after the Redcoats couldn’t generate any kind of offense, the team came through with nine hits as it beat Plainville 7-1 Tuesday afternoon. Ryan Hyde finished with three RBI on a double and sac fly to lead the offense, while Jeff Kuzoian and Dan Valdesi added a double apiece. Valdesi also picked up the win on the mound for Berlin. The Redcoats took a 2-1 lead in the bottom of the third and never looked back, tacking on three more runs in the fourth and two more in the sixth. Jordan Bishop received the loss for Plainville. The win improves Berlin’s record to 9-7 on the season. New Britain 3, Tolland 0: Will Homar pitched a complete game and struck out 11 batters. The senior gave up two hits, no runs and two walks. Michael Gajda hit a double and an RBI while teammate Melvin Rodriguez also has an RBI. The Hurricanes are now 10-4 on the season. Newington 7, Rocky Hill 6: The Indians won in dramatic fashion. Rachel Thureson stole home in the bottom of the sixth inning to score what would ultimately be the game winning run. Both teams went in at .500, but Newington came out on top to improve to 7-6 on the season. Rocky Hill falls to 6-7. Rachel Roncaoili, Maddie Santo and Mel Tejeda each had a triple for the Terriers. Cyan Gonzalez and Savannah Gelm each had a double to power the Indians’ offense. Gonzalez was productive from start to finish, going 2-for-2 with an RBI and two runs scored. Dani Pantano picked up the win for Newington. Roncaoili got the loss for Rockey Hill from the pitching circle. RHAM 7, Newington 0: The Indians had a tough day on the court as they got swept by the Sachems. Newington was able to push three matches to a deciding third set: the No. 3 singles, No. 2 doubles and No. 3 doubles. Lukas Kian and Tras Panchyshyn were almost able to squeeze by with a win, but fell 6-3, 3-6, 8-10. The Indians’ record drops to 6-5 on the season. Bristol Central 189, Plainville 204, Bristol Eastern 220: The Blue Devils fell just short of The Rams, but topped the Lancers. Plainville’s Zach Barolini was the medalist as he shot a 42. The Blue Devils were also led by Christian Gamudio (53), Allan Nilson (51) and John Kenndey (58). Plainville is now 4-5 on the season. Hall 202, New Britain 267: It’s still about improving for the Hurricanes. Cate Keithline was their low scorer with a 54 and was followed by Kiley Griffin (67), Kendra Levesque (73), Morgan Giantonio (73), Leah Gaffney (81). Middletown 108, Berlin 42: It was a tough day for the Redcoats as the Blue Dragons were in control of the meet from the very beginning. Juniors Jimmy Greico (400-meter sprint), Matt Bacon (110-meter hurdles) and Alex Halkias (200-meter sprint) all took home wins in their respective events. Alejandro was the lone senior on the squad to win his event, the 300-meter hurdles. Posted in New Britain Herald, Berlin, New Britain, Newington, Plainville on Tuesday, 8 May 2018 21:20. Updated: Tuesday, 8 May 2018 21:22.